Wanna go on a long trip on your motorcycle and have to carry your luggage with you? Now it’s not a problem anymore! With Suzuki Intruder Motorcycle saddlebags you can easily carry your luggage safe and sound to your destination. Suzuki Intruder Motorcycle saddlebags are made of hard wearing Viking leathers which give the classiest look to your bike while it’s also increasing its durability of your bag. These bags come with air-tight feature and internal pockets. The heavy-duty ABS Plastic and full metal frame prevent your bag from sagging and everlasting shape retention. 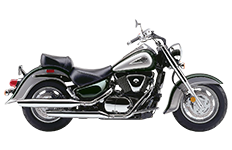 These Suzuki Intruder Motorcycle saddlebags are highly economical with 30 days money back guarantee. Bags are available in different shapes, sizes, and colors which is the best for anyone to choose according to their desire. 100% waterproof and 30 days money back guarantee ae the best features making it worth to buy.